Up to now, BITSPACE is a one-man-company and SPACEBALL the first game published. The company emerged after recognizing, that there are no real 3D games at the computer gaming market. Mainly I am working as an engineer at the simulation department of a defence company in Germany. Long ago, I studied aerospace engineering and among other things designed spacecraft at the german space industry. Some of my designs were even realized. After that I changed to a smaller company and was busy pre-developing big amusement rides, i.e. I invented them, calculated completely through, simulated them precisely, and displayed them as moving 3D models so that customers could make a virtual test ride. 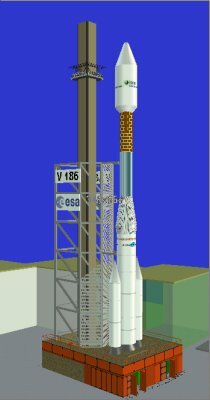 Besides you see a screenshot of a simulation of SHOT MAXI as it was built at Space Park in Bremen, Germany. The gondola at the tower at left is shot up 184 ft in 3 seconds. I showed all these designs and simulations since 1995 using VRML, a language for 3D content on the internet ( VRML at web3D.org). Though nearly nobody completely used all the opportunities of this language, it is already perceived as being 'old' and there are only few people further developing it. Therefore, these games are now programmed using the A7 Game Engine from 3D Gamestudio, a complete and inexpensive software package which, especially after the introduction of the new script language Lite-C, offers anything needed for the design of a good game. The comparably good documentation helps learning it alone. But in spite of that, the programming of a game for sale is a remarkable effort and it is much more than you would do when just making a program for yourself. So, I would like to make you think of this before you hand over a copy of one of my games to a good friend who distributes it even further without a cent arriving at my pocket. Sometime then I will loose the fun in doing these games when I earn nothing for all this work. Yes, I have fun with mathematics, but searching for all possible bugs in a software is something different.